Music is a magical part of one’s day. Music takes on many roles; it may be a motivator while working out, an entertainer while traveling, a soother while stressed out, or an expresser of one’s feelings. Music is also a powerful tool to help interact with your child. It can aid in communication, calm your child down, and even change his or her mood. 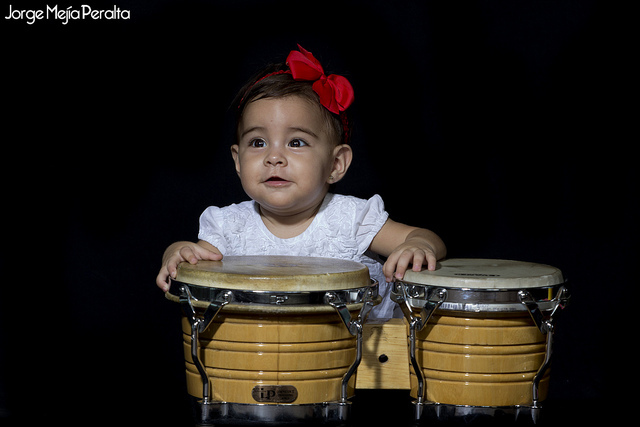 In order to interact with your child through music, incorporate music into your daily routine. Music should be present during play time, car rides, bedtime, and any other free time spent with your child. Singing to your child should be an intimate time spent with him or her. Your child will not judge if you are not an amazing singer, but will appreciate the fun aspect of music and time spent together. Choose songs with slower tempos so your child can adequately hear the words and eventually join in! Add movement to songs! Sing songs with fun gestures such as “The wheels on the bus”, “Patty cake”, or “The itsy bitsy spider”. Use visuals with the songs and rhymes by reading a nursery book. Sing songs with repetitive versus such as “5 little monkeys jumping on the bed”. Create your own music with pots and pons, shakers with rice and beans, or toy guitar and drums! Use the OWL approach when taking turns with music. OWL stands for observe, wait, and listen. Observe your child’s current mood and choose songs that correspond. If your child is happy, sing an energetic song with lots of movement! If your child feels sad or upset, sing a soothing song. If your child needs motivation to get ready for a meal or clean up his or her toys, sing an interactive song. For example, “The ants go marching” is a great transition song from one activity to another. You and can your child can move on by marching together to the next room or activity. The clean up song is also a classic song that helps encourage everyone to pick up his or her toys. The next crucial part of OWL is to wait. Pause right before a repetitive verse or movement to allow time for your child to try it on his or her own. Finally, listen to your child. They may start to initiate a song through a movement, sign, or word. Singing with your child can be a magical experience and can create a deeper interaction with him or her. Continue to add music to every aspect of your day. If you can’t remember the words, make them up! You can even make up songs that are relevant to your child’s life. Most importantly, have fun! Pepper, Jan, Elaine Weitzman, and H. Ayala. Manolson. "Moving Forward with Music." It Takes Two to Talk: A Practical Guide for Parents of Children with Language Delays. Toronto: Hanen Centre, 2004. 151-154. Print.